I would have to say Caffé Italia in Marblehead. Their bolognese sauce is to die for; I like the restaurant better than the other Italian places such as Antique Table in which I found the food to be a little too salty. The Barnacle in Marblehead is my favorite little gem. It’s not that easy to find, if you don’t know Marblehead well, parking can be challenging, but it’s worth a few laps. The views are great, the staff is authentic and the seafood is fantastic. Nice work ladies – so exciting: your first giveaway! My North Shore (not so hidden) hidden gem is Tacos Lupita in Haverhill. I love the gorditas, their hand patted tortillas and the tacos carnitas. We have a lot of gems that we’re not sure we’d describe as “hidden,” but Chianti in Beverly is a favorite. Terrific food, very friendly staff, and an intimate, romantic atmosphere. If you don’t want the hassle of getting into the North End (and finding parking there), you could do a whole lot worse. What North Shore restaurant is your favorite hidden gem? I am not sure how hidden it is, but the Amesbury Ale House is one of my favorite restaurants on the North Shore. Nine Elm is great! I remember commenting on your review you did awhile back as I had happened to go there right around the same time. As for a hidden gem, I’d say my favorite would be Giuseppes in Newburyport. I’m a bit biased because of how close their location is to my house, but it’s the first real, “home cooked” Italian I’ve had on the North Shore. They also really cater to the take-out crowd, and picking up some homemade Italian food on the way home from work is a nice treat. Garden City Pub is a great little hidden gem …hidden ..if you don’t know its back there !! btw Friday is my birthday it would be a great present to win !!!! Agree, not sure how hidden my choice may be but we love Tryst in Beverly. Cathy’s Country Kitchen on Rt. 1 in Rowley is incredible. The best breakfast place ever – hands down. The raspberry scones are amazing. We try something new there every time we go, and have never once been disappointed. Cielito Lindo in Beverly, absolutely. Love their sangria and guacamole. I’ve never been to Nine Elm! It sounds crazy to recommend this as a hidden gem as it is inside a mall but it is so tucked away inside Nordstrom that 90% of people we tell about it say they’ve never heard of it. Excellent service food and prices. Dube’s in Salem for fried seafood! Off the beaten path and quite good! Foodie’s Feast in Marblehead is great for picnics at the beach or Crocker Park. Umberto’s in Boston. Only open for a few hours for lunch, but they are great! So this restaurant isn’t so much of a hidden gem, but Sixty2OnWharf in Salem is AMAZING. Some of the food I’ve had there has been better than the food I had in Italy. They are always using fresh local ingredients and their drink menu is constantly changing. I’m taking the “hidden gem” part seriously, so I’d say Pho Minh Ky in Lynn. Great pho, perfect for a gloomy day. I appreciated your recent post on Turbine in Lynn because that’s my favorite North Shore dining spot! The wine selection is fantastic, the food is always outstanding and the staff are incredibly friendly and attentive. Nothing better than a St. Joseph’s sandwich at Virgilio’s Bakery in Gloucester. I love your blog. You remind me to try new places, so I’ll find a new tried and true. Is it rude to say that I hope I win. Because I do. Hope I win, I mean. We have friends who rave about Nine Elm Street and this would be a wonderful opportunity for us to try it out ourselves. It’s not hidden but Nine Elm is definitely one of my top favorites. I think the Franklin Cape Ann in Gloucester is a winner every time!! Not so hidden anymore is The Blue Ox, burgers and steak to die for! Sorry, was I allowed two? Lincoln’s Landing in Swampscott. It’s nothing fancy, but the food is made to order. Last time I ate there my blueberry pancake was cooked perfectly and my turkey sandwich had real turkey meat on it – not the salty, processed stuff. Best little hidden gem is definitely Cafe Azteca in Lawrence for authentic Mexican! The Rudder on Rocky Neck in Gloucester is a family favorite. The food is exceptional, with the mussels at the top of my list of must-order items. Yum! I have to second a vote for Cielito Lindo…went there for the first time a few weeks ago….OMG, it was great! Can’t wait to go back when I am not pregnant for some pitchers of Sangria! Yella in Andover Center. It’s tucked away on a side street and it is small, but the food is great and the service is excellent! I would have to say Evenfall in Haverhill. Riverview in Ipswich is a favorite hidden gem. They only serve pizza, with a full bar. The BEST pizza ever. SO good. Depot Diner in North Beverly for breakfast or lunch. I’d have to say 15 Walnut in Hamilton is the best hidden gem. You’d never imagine a restaurant in Hamilton Plaza would serve such amazingly fresh local food. 2nd Choice- 9elm. I love going there and feeling like part of the family. Chef Matt does it right! If you’ve not been to either of these restaurants go! NorthShoreDish would agree I’m sure. Mad Martha’s on Plum Island! Funky, beachy, and the best breakfast you’re likely to have. Go hungry and come away happy! Love 9 Elm … their steak sauce can’t be beat !Also profiteroles for dessert. 15 Walnut in Hamilton has excellent locally-sourced food. Particularly good is their Cuban Sandwich with house-cured ham. Also, they have the best Buffalo wings on the North Shore. We just had a terrific meal at Sixty2 on Wharf in Salem. Phat Cats Bistro in Amesbury. Odd name, great husband-wife team cooking in the old Wild Bites location on Market Street. I’d have to say 9 Elm…it is great and enjoyed your review of it! Riverview in Ipswich is our favorite. It is “hidden” on Estes St., near EBSCO Publishing. Delicious thin-crust pizzas at prices that are unbelievable. This place is not fancy and the atmosphere is very old-school; has not changed much in the fifty plus years that they have been there. The only thing on the menu is pizza, but they do it right! They also have a full bar. Great neighborhood feel to it, too. Highly recommended. black coffee and a chocolate chip muffin from the last stop in east gloucester. Bella Verona in Salem. It’s a tiny little place but very warm and welcoming, with some of the best Italian food around. 9 Elm. The duck. Nothing beats it. Lat 43 in gloucester is a new find for us. Love the North Shore. Our maybe not so hidden, hidden gem is LoGrasso’s in Rockport. For Frozen Hot Chocolate & other “goodies” Coffee Time in Salem is my gem. We really enjoy Sawasdee in Danvers. Great Thai. 62 on Wharf, while not so hidden is a great spot for a never-fail meal, fantastic drinks and friendly owners and staff!! Lewis’ in Essex. Best prime rib around and the menu prices are great! Not exactly hidden… Tryst, Cabot Street, Beverly. Specials and menu items are always delicious. Cozy atmosphere and great service. The best “gem” is Reds in Salem. They have pancakes the size of hubcaps! A new addition to the Newburyport restaurant scene is Loretta’s (where Aquatini used to be). Ate there for the first time this week. Great food. Great service. Unbelievable prices! Here is more praise for Sixty2OnWharf in Salem. This restaurant is truly a hidden gem! Passports in Gloucester is a real gem. Start off with their signature complimentary pop overs and you are hooked. A menu with variety to suit all tastes and budgets. For a ‘can’t fail’ dining option, you should have Passports at the top of your list. Our recommendation for a hidden gem is Rawberts Organic Garden in Beverly. for sandwiches, Manhattan Sandwich Company in Marblehead. I could eat the whole menu. 9 Elm is so special I asked to have my birthday dinner there (and my wish was granted) Another “hidden” gem is Duckworth’s Bistrot in Gloucester (last year’s birthday dinner)! 9 Elm in Danvers Square. Working our way thru the entire menu. Love the halibut and everything else. Fantastic staff, too. I have to echo post#58. Duckworth’s Bistro in Gloucester and 9Elm are our hidden gems. Service at both is exceptional, as is the food. The bar at Ithaki in Ipswich is a close second. Nathaniel’s in the Hawthorne Hotel offers great meals, in a beautiful room, with live piano. Martini’s are very good as well. Went to 9Elm for my birthday earlier this month and it moved to the top of my list. I’d say Bellino’s in Wakefield is my top pick right now. One of my favorites is Thai Choice in Gloucester. Fresh and tasty dishes. I’m completely obsessed with Siam Delight in Beverly. Best Thai on the north shore! The Sawasdee Thai restaurant in Danvers Square is wonderful. Great food, beautiful ambiance, good prices. Have to vote for LobstaLand! Royal Orchid in Rowley. Great Thai with atmosphere! Petrillo’s in Peabody, just off Peabody Square on Foster St. Everything on the menu is superb and the specials are “special”. Great food and great value! It’s so hard to pick when food is just so tasty! When I’m working, I like picking up something from either Tacos Lupita (Lynn) or Evan’s Deli (Marblehead). For a nice dinner, I’m a fan of Bella Verona (Salem). A tiny little restaurant with fabulous food and some of the friendliest staff ever! We love Duckworths Bistrot in Gloucester. A true hidden gem…..although a reservation is a must (I guess that means it is not too hidden). Ken and Nicole Duckworth are an amazing team! Out of the way on Rt 1 North is the fabulous family-operated Ponte Vecchio. Great for pizza, wine, gnocchi and much more more. Drive a couple of miles past the “famous” seafood place in Essex on 133, and check out Essex Seafood. No lines, (yet) no frills, but far better than the rest. Dom’s Trattoria in Beverly Farms is a must. It is inexpensive and casual but everything is homemade from scratch and delicious. We go at least once a week for lunch and sometimes more. Jalepeno’s in Gloucester! Authentic Mexican Food and great atmosphere. Not so much hidden but haven’t seen it mentioned yet is the Pilot House in Gloucester. Nothing to look at inside or out (wish they’d update the decor) but the food and prices are terrific. I love their baked stuffed shrimp when they have it! Everyone loves Italian food, but you don’t always want to do a big dinner or pay big bucks. Cafe Graziani in Salem is a small, quaint place that you can either grab dinner or, as my wife and I prefer, stop in for a quick lunch. Even on simple dishes like a meatball sandwich, the sauce is chock full of herbs, and the price is right. The Blue Marlin Grill in Essex is my hidden gem. Where else can you get combo entrees that including, but not limited to, steak tips and fried clams, chicken and haddock, and too many more to mention. The baked seafood cassarole is “to die for”…take it from one who is not a big “fish” eater. The huge bar/hi-top lounge area is where “it’s happening”! Thai Thani in Swampscott, they have the best chicken crazy noodles in the northshore! Not sure if it’s a hidden jem…but the Wild Horse in Beverly certainly always provides us with great food, drink, and a good atmosphere. Start in the bar with the nachos and a martini or brew…and then move into the dining room for a pretty decent meal. Love to go to Soma in Beverly with friends…great drinks at the bar. The hummus is the best! Sawasdee in Danvers. Their curries and Crispy Basil Chicken are fantastic. Tryst in Beverly! Yummy food, lovely setting. Like a lot of other, not exactly a hidden gem for most, but Sugar Magnolias in Gloucester is awesome! Breakfast faves are Carrot Cake Pancakes (with maple cream cheese butter) and Crab Cakes Benedict; lunch faves are Fish Tacos and Corn Chowder topped with Caribbean Jerk Grilled Salmon! Humm……would have to go with Riverview in Ipswich………yes, it is a gem that needs polishing but for traditional pizza that is as good as you remember when you were a kid at prices that look like they forgot to update the menu in the last 20 years, Riverview is the way to go! Have to give a big thumbs up to Plum Island Grille. Not so hidden (like many of the previous posters), but The Grapevine is my favorite North Shore restaurant. 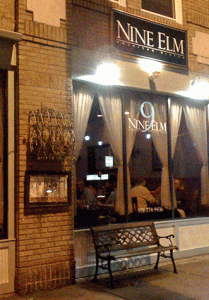 It’s has a great neighborhood feel and the food, wine, and service is always fabulous! My hidden gem would be The Causeway up on route 133 in Gloucester. They have great daily specials and the long wait for a table is due to the many locals who know this is the place to go for fresh, delicious seafood at reasonable prices. Hidden gem: Cafe Kushko in Salem. Hole in the wall kind of place, but the food is delicious! Without doubt, 5 Corners Kitchen in Marblehead is a gem. Small place with a great chef, great location that is badly in need of a decent restaurant. I’m surprised nobody has mentioned Fire Bull in Peabody. It’s our goto place for when we’re feeling particularly carnivorous. So many great choices listed to this point. I will choose a hidden gem without cocktail service. Being a craft distiller it may be professional suicide to choose one customer over another. (insert smile). The Cupboard in Gloucester satisfies my humble needs. BBQ chicken, cole slaw and the rolls. Summer is truly over when Cindy and Grover close for the season. A unique, dining “gem” is Angela’s Cafe in Saugus, on Rt.1. They only serve chicken wings, coal fired pizza, and salad. But the chicken wings are unbelievably tasty and the pizza is delicious. You’ve got to try these chicken wings!! Jewel in the Crown in Newburyport. Definitely tucked away. Best Indian food Anywhere. My hidden gem is Essex Seafood located on Route 133 in Essex, the seafood is fresh, the prices are reasonable, and each order has a generous amount of food. Have to say the Old Spot in Salem. It is the perfect place for an early family dinner on Sunday night. They have a menu that makes everyone in the family happy! Hale Street in Beverly Farms – Great Oysters, Sushi and Specials. Ithaki in Ipswich – Great food, nice job on the remodel! I have to say my favorite hidden gem is The Causeway on Essex Avenue in Gloucester. Great seafood – huge portions! I have never heard anyone say they don’t like the Causeway! Abrahams in Newburyport- BEST salads, sandwiches, bagels and pizza….I go for a dried cranberry, blue cheese and glazed walnut salad- leave with a bag of french toast bagels. There is usually a kid picking the fresh basil out front and a beautiful patio to dine on. 1640 Hart House, Ipswich, MA. La Trattoria on Main Street in Gloucester. Great Sicilian food and great prices. I have a few. Our favorites are La Trattoria and Passports, both in Gloucester. Not so hidden, but G Restaurant in Swampscott! The best hidden gem on the North Shore is Deb’s Pilgrim Diner in Salem. Homecooking at its finest and the best breakfast around…the most delicious pancakes ever. the best hidden gem for breakfast is at the ipswich inn on east street in ipswich. see menu here http://ipswichinn.com/menus.html great place to take mom.